Come and play both days for only $260.00 Includes; green fees, cart, $35 towards the Cash Pots, and Taxes!. ($5.00 Credit card processing fee) PLAYERS MUST CONFIRM BY Thursday morning Sept 13th!-if space is still available. 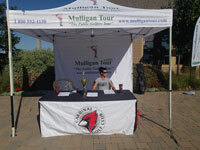 The Mulligan Tour "majors" are the most sought after events after the "Ryder Cup". 2 Day events are much more a true representation of a golf event (anybody can be "hot" for one day!) to sleep on the lead and come back out and face your peers will make every shot on Sunday that much harder! 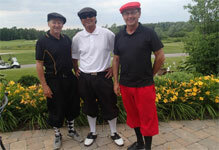 Our "Toronto 2 Day Chapter Finals" event will be held at St Andrews Valley Golf Club. Day two will have the leaders off last on Sunday! We will be offering a Golf Pool with us as the players (pick a team of 4 players with the lowest combined Net score after the 2 days) and a Calcutta (pick the "net" winner from our players) both of these are $5 per Calcutta pick or team for the golf Pool. Points for all Majors are 1.5 times the point value! 9:30am - Tee Times for second round start with leaders off last.